Posts Imagining the Divine . . . as a Woman? This is a tale of three statues, and the stories chiselled into them. It’s a personal story, and it is part of the reawakening of the power of the feminine; more hidden but no less important that the campaigns to bring equality to the workplace or the ballot box. One hundred years after getting the vote, women still have some catching up to do. Not least in the area of ultimate authority – the sacred. It wasn’t always this way. I wonder what images come to your mind when you think of the Divine. Who do you turn to when the going gets tough? To whom (if anyone) do you cast a prayer? 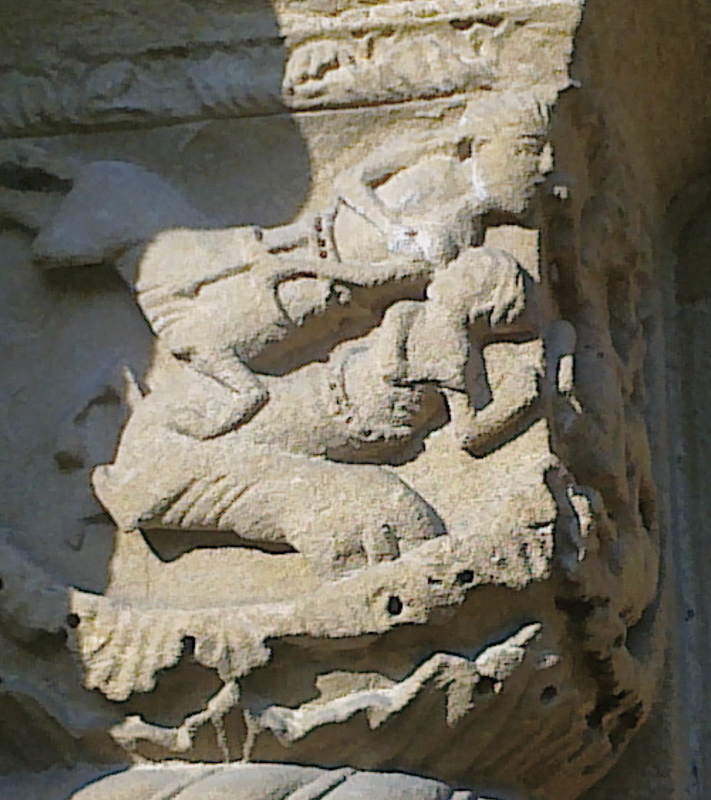 At the church of St Mary’s in Iffley village, near where I live in Oxford, there is a remarkable carving. It’s not inside the church. You have to walk around the side to the small south door and look carefully to the left. And there she is: half horse, half bare-chested woman, offering her breast to her foal, in mid gallop. I return to this image of a Mother on the hoof regularly. I love the power and strength of the horse, in combination with the nourishment offered by the breast. She seems complete in herself, this horse-woman, celebrated in the most natural and beautiful act of feeding the next generation. Searching for other inspiration, I went to the Imagining the Divine exhibition at the Ashmolean Museum. I soon tired of reading the academic texts introducing each piece. This dry information seemed to miss the point of what the artefacts were originally for – worship, evoking wonder. Instead I wandered, allowing myself to be drawn to what interested me. Amongst so many gods in different forms, I was searching for glimpses of the goddess. On a small side wall in the Buddhism section I found a relief of the head and torso of a powerful woman. You could see the halo carved above her head, part of a beautiful face, perhaps a hand raised in benison. Many of the pieces in the exhibition were old, and had pieces missing, so it took me a while to realise. And then the reality hit me. Her nose was chiselled off, her face gouged, her breasts brutally hacked off. Clearly, whoever did this could have smashed the whole piece. This was somehow worse. It was an act of conquest that said, Keep your goddess but let her be a shell of her former self. Now she can no longer bless. Her compassionate eyes no longer see. Her breast may no longer give nourishment. We have the power now. We with our weapons. Be afraid. I forget the details of which tribe did this to whom in which century. It is simply one example of a million. But standing beside this stone statue, I felt the force of the violence personally, with a shock of familiarity. The full meaning of the word ‘Desecration’ moved through my body. I had known that in many places in the world there was once a flourishing worship of the divine in female form, and that this was deliberately, systematically overthrown. But to stand beside the evidence, to see the blows of hammer on carved stone, that is a powerful awakening. It matters deeply, because we still live with the scars of this sacrilage, the shaming of the natural beauty and power of woman. At some level, all of us know how this feels. #MeToo. I picked myself up, and continued to wander through the exhibition, while this broken form resonated in me. Finally, I found something that gave me hope. Of course, if you Google Kubera and Hariti, as I did, you will discover all kinds of complications, local variations, scholarly disputes, changes of name, stories of demons, ogresses and even devoured babies. But allow me my fantasy for a moment. Just think. 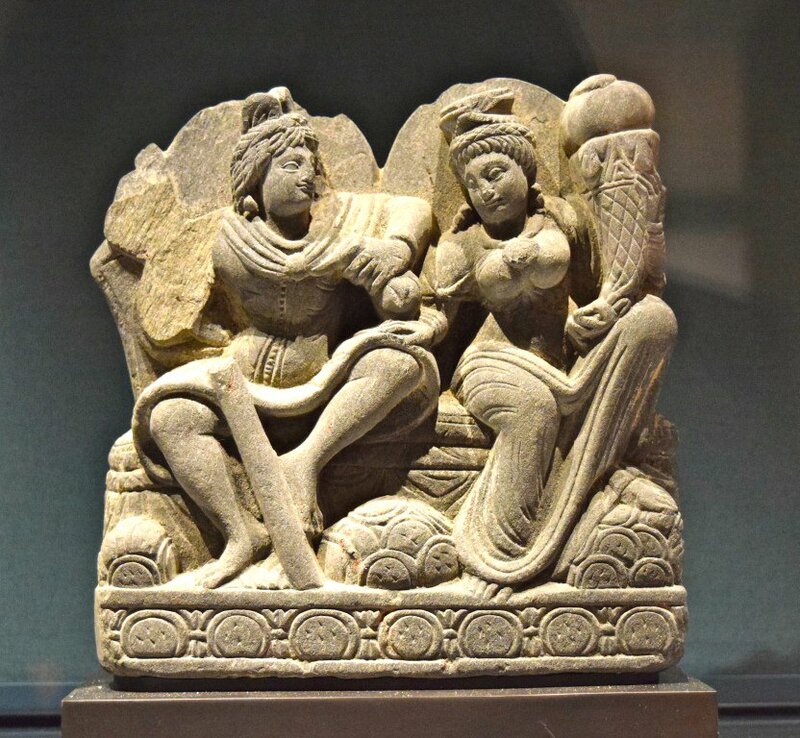 In the entire exhibition of Imagining the Divine there were gods as rams, bulls, many armed beings, just feet on their own, and one or two goddesses, crafted smaller than the gods, needing rescusing, or sometimes as consorts and lovers. A glaring lack of the powerful divine women, except one, brutally disfigured. And just this one image of a divine couple. What we worship, what images we contemplate, what we deem sacred, defines who we are, how we feel and how we behave. As a married woman, living in the violent death throes of the patriarchy, I need this image of equality and partnership. It represents a reality I am working towards, creating a life of abundance with a man I love. Different people need different gods. If we are going to redream this world, and heaven knows there’s an urgency for that, we need to have some images, some stories, some songs to build our dreams upon. Wherever we find them, we should cherish them. And what if we can’t find them in the world? Then isn’t it our sacred duty to seek them with our imagination? In other words, and I mean this with the greatest respect to all creatives, to make them up? There are various ways in which I plan to be doing just that in 2018, both in my creative work in story and in song, and as a holder of space. I warmly invite you to join me in the endeavour. Please click the links for full information on all these events! A nine-month transformational course for women in Oxford, with accompanying audio recordings of meditations and chants accessible from anywhere. Starting April 2018. Bookings being taken now.